Over 35 years ago, Paul Keevil arrived in America to jump-start a music career. He now owns three restaurants, including his latest that’s meant to redefine how we think of Mexican food. Why: To give people real Mexican food, not the gringo version. Dishes: Customer favorites include the gorditas (plate of 2 masa dough pockets with choice of any taco filling) and the Al Pastor tacos (grilled achiote-marinated pork and pineapple). Daily specials have included head-to-tail items like beef heart and head meat tacos. In fact, the British-born Keevil–who also owns Millie’s Diner and Lulu’s– migrated to Los Angeles in 1976 to spark a music career. “If you wanted to make it, you had to be in LA,” he said. But music isn’t Keevil’s lasting influence. Living in America, Keevil continued a hobby that he had forged across the pond: cooking. In Los Angeles, he was especially fond of making his own curry, playing with “big, bold flavors” that were to become the linchpin of Millie’s menu. But the Millie’s that Richmonders know began in Los Angeles. In 1983, Keevil and a partner opened an eight-seat Millie’s in the city’s Silver Lake neighborhood. He said that the restaurant soon became a “who’s who of the rock and film world.” Annie Lennox and members of the Red Hot Chili Peppers were often spotted there, as was Paul Reubens (Pee-wee Herman). Matt Groening, creator of The Simpsons, contributed art to the restaurant. In the late 1980s, Keevil left Millie’s after he and his business partner “had different ideas” about running the restaurant. Keevil left the country, spending several years kicking around London. It was the “right time, right place for that sort of food,” Keevil said about Millie’s. He wanted “five-star cuisine in a casual environment.” Later, in 2007, Keevil helped open another Shockoe restaurant, Lulu’s. But in recent years, as he worked to sustain Millie’s success, and nurture that of Lulu’s, Keevil became smitten with another restaurant concept: Mexican. “I’ve always liked Mexican food,” Keevil said. He reasoned that Millie’s “always had an element of Latin American food,” and one of Lulu’s most popular events over the years were its Cinco de Mayo parties. Creating a Mexican restaurant made sense. 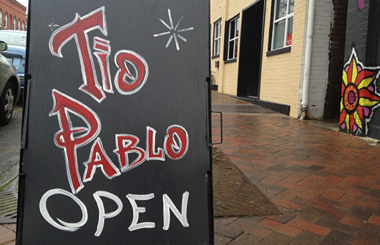 In early 2012, he opened Tio Pablo. He describes the food as “a lot more authentic than other places.” For instance, he says other restaurants often serve a pico de gallo that’s runny. However, Tio Pablo’s version is thick and chunky. Tortilla chips sometimes aren’t strong enough to support the weight of single scoop. Keevil said that this isn’t a Tio Pablo misstep–it’s simply the way pico de gallo should be. “We don’t sell chimichangas,” Noriega said about the popular southwest cuisine, albeit one not native to Mexico. And you’ll find no burritos at Tio Pablo. “You go to Mexico, they don’t know about burritos,” he said. One thing you will find are the Gorditas ($4 single, $12 plate), a masa dough pocket with a choice of any taco filling. Noriega said it’s one of the most popular items.2 Another popular choice is the Al Pastor taco with grilled achiote-marinated pork & pineapple ($3 each, $10 plate). The frijoles charros ($3) are a commonly ordered side, and daily specials have been known to include head-to-tail items like beef heart and head meat tacos. As to the interior, it looks less like a kitsch Tex-Mex spot and more like a Taqueria you’d find in San Francisco’s largely Hispanic Mission District: stools line the tables on side walls, with a center table to accompany either a large group or a medley of individuals. 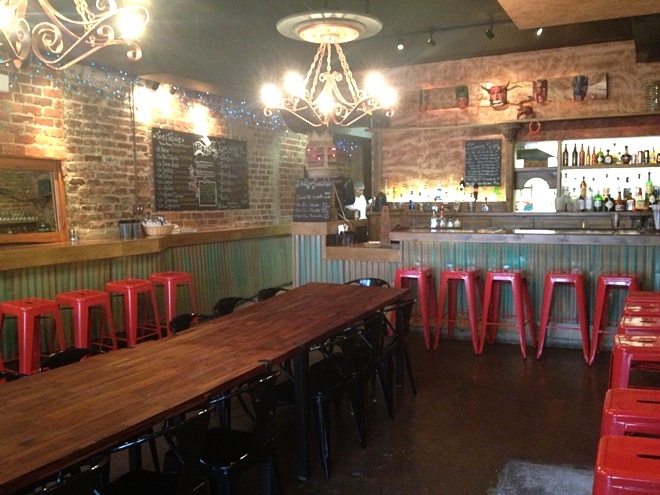 Now with three restaurants in Shockoe, Keevil is firmly “invested” in this part of the city. Tio Pablo is in a particularly interesting location, as it’s the former site of Boom Boom Burgers, whose owner penned a letter criticizing the neighborhood when that business closed. Keevil, like others, thinks the area has its share of issues, namely the heavy, nighttime police presence due to the area’s nightclubs and bars. Put simply, it’s “not good for business,” he said. But Keevil thinks Shockoe will prosper in the coming years. “I believe this area…has to come around again,” he said. As for Tio Pablo, Keevil has big plans. He expects the restaurant will increase its catering operations and maybe even one day bottle its own salsa. But for now, he wants Tio Pablo to establish itself as a Mexican restaurant unlike any other. Maybe then he’ll get to play music again. Tio Pablo is located at 1703 E. Franklin Street. Glad to see another quality business in the Bottom. My Mecca for authentic Mexican food is in South Richmond along either Jeff Davis or Broad Rock where if you order in English, they have to scour the store for someone who speaks it. Simple menus with modest prices often with an attached market, my kinda place. Absolutely LOVE Tio Pablos. That was my treat for Fat Tuesday. I know it sounds scary, but seriously, try the lengua. It is amazing!